At Sunny’s Pools & More, we carry one of the top pool liner brands in the industry GLI. The GLI above ground vinyl pool liners is considered to be some of the best on the market. In addition, the Liner Doctors line is the preferred liner for professional pool installers. With the quality construction and beautiful look, they really make your pool stand out. 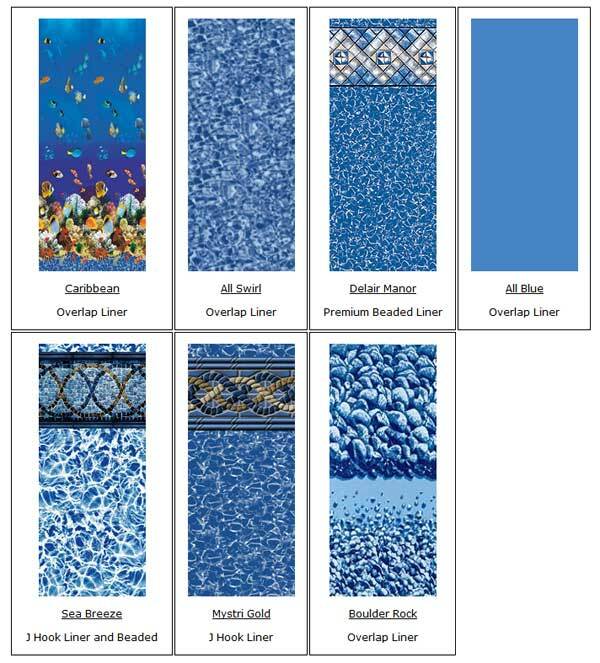 The Liner Doctor line has a large selection of patterns to choose from. Also, they built from high-end vinyl and backed by a great warranty. Here are some key aspects of the GLI Liner Doctor pool liners. We carry GLI, Aqua-Vinyl, Swimline & Findlay Swimming Pool Liners. They are precision crafted in a climate-controlled facility. These liners are made to fit swimming pools perfect. The unprecedented quality and design shine through in style, fit and durability. Liners are available three different ways examples shown below. Q. Is there a difference in liners? A. Yes, there are three different applications. Overlap liner, this liner drapes over the pool wall plastic coping is clipped on to hold into place. You commonly see liner on the outside of the wall. J-bead hung liner has a vinyl hook on the top that hooks on the top of the wall. These liners are normally patterned with a tile border at the top. The beaded liner has a bead at the top that snaps into a bead receiver that attaches to the top of the pool wall. This is a really nice liner comes with nice tile border patterns also for installation very easy for a do it yourself. Another benefit is that if liner had to be replaced, you would not have to take any of the top seats off the pool. The liner will snap right out of the track and the new liner snaps in. What separates us from the competition is our equal attention to service, price, and quality. In addition, we feel it is very important that these elements are met in order to properly serve the customer. These liners provide a higher quality, thicker mil a/g liner than the competition which will provide a more durable and longer lifespan for the customer. Also, special attention is paid to each liner order throughout the production process to ensure it meets high-quality control standards and the customer receives exactly what they ordered. Finally, there are ever changing pattern selections in an effort to have the most up to date selection in the industry.